Noah was a such a great example of faith for us to follow! Faith is something we need to use everyday. Just like life is harder for us than it was for our parents it will be even harder for your child. Faith is something that can help us through. Instill faith in her now, she will need it later! Prepare Treat - Animal Crackers - & maybe dip! Clicking on the link will send you to a website where you can play the music online. Invite someone to give the opening prayer. 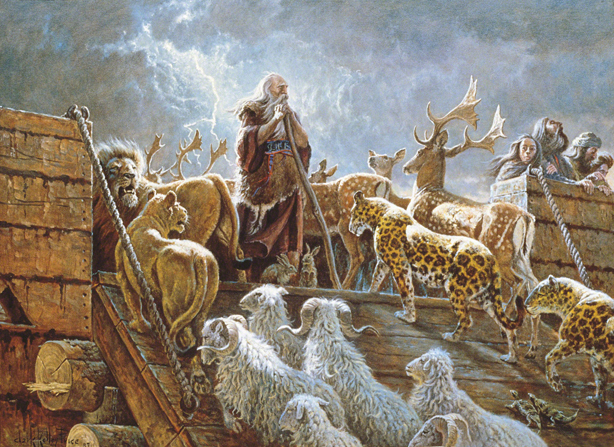 Read the verse, you can also simplify the verse by saying "Heavenly Father told Noah to build a big boat called an ark"
In this activity you are going to say the names of animals and then make the sounds they make! If your child is a little older you can even act like the animals - walk on all fours etc. You can look at pictures of the animals while you do it. Repeat a couple times if you want to, just have fun with it! Suggested Treat - Animal Crackers! You can make a dip to put the animal crackers in like chocolate, whipped cream, or even fruit puree. For a simplified 1 sheet print off for this lesson click here! For any comments or suggestions for this lesson - post them here!